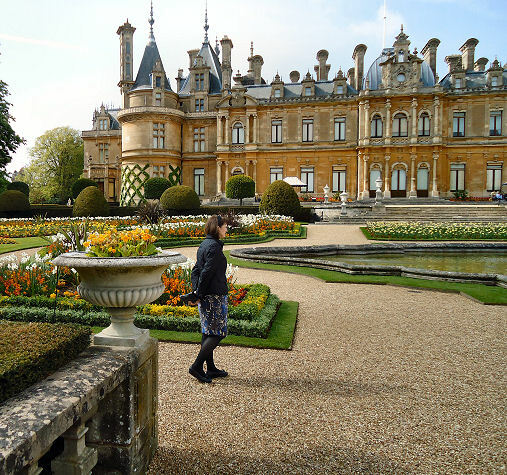 The house was built in 1874 by Baron Ferdinand de Rothschild to house his art collection. If you are expecting the National Gallery you will be disappointed although you will find Joshua Reynolds and other Premier League names littered about. The furniture, porcelain and other items though are stunning and well worth a visit but expect it to be a bit gloomy as it was conceived a the height of high Victoriana with items crammed into every conceivable space and the rooms dark, often with dark wooden paneling. Still the building and its contents were bequeathed to the National Trust in 1957 so we are lucky to have it all still. Not surprisingly for a building that looks like a French Chateaux there is a good deal of french decorative arts to be seen inside. 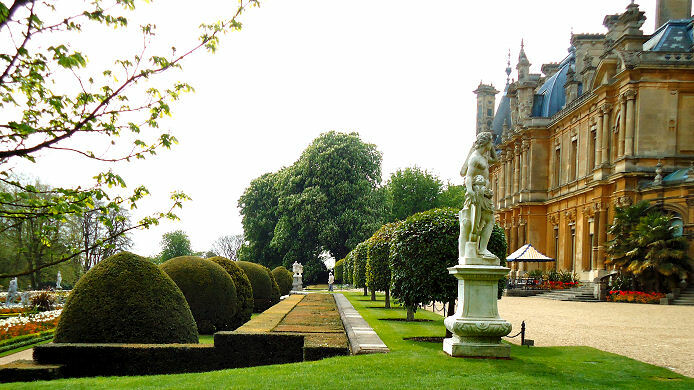 Waddesdon is famous for its parterres to the rear which are a riot of colour and are designed to be seen from the bedroom windows and also to be strolled through. The number of bedding plants that it takes to fill this space is stunning and all is enclosed by well kept strips of grass. The Trust state that it takes 19,000 plants which are changed every May and October. This carpet bedding is normally planted as a theme to represent events from the family’s history or exhibitions which are currently showing in the house. 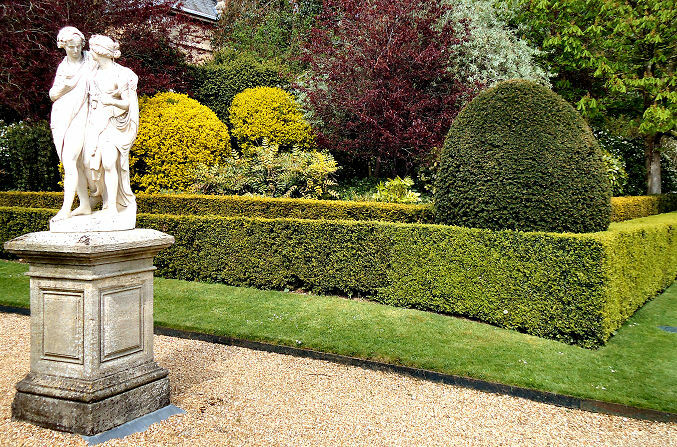 When you approach the parterres from the house you do so from a terrace, or viewing platform, which has a row of standard trees at the top and then a row of yew specimens alternating in shape from cones and balls. These ranks of trees stand like an army of foot soldiers guarding a palace and in between are magnificent white statues punctuating the rows which look like officers and generals. In the centre of the parterre is a magnificent pool which begs you to walk around it as it is just the right size and on a clear sunny day (that is very occasionally) it provides reflections of the house and garden to marvel at. Doubtless too it has seen a few champagne drinkers taking a dip on a summer’s evening. 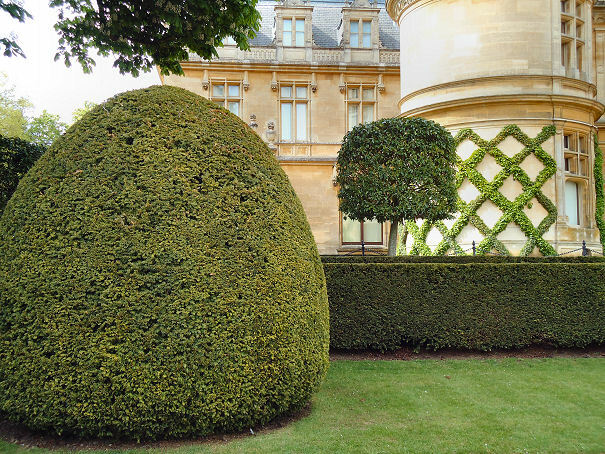 You will find box elsewhere but the “hedges” of the parterre are made up of two lines of plants cut to shape with the coloured flowers inside this structure. Although there are low yew hedges on the top terrace you will need to go to the edges of the formal garden to find the best examples which form an upper wall to a stairway down to a lower terrace where no doubt guests could hide away in secret conversations or go with amorous intent. 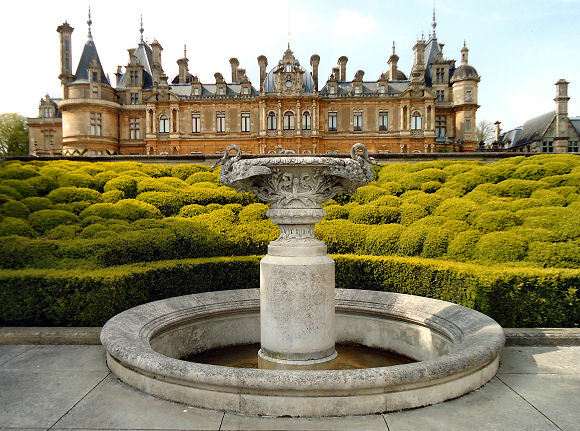 Box is not used in the parterres but there a box hedges on the lower formal terrace with its small fountain and this is in filled with box plants which have grown together to form an undulating pattern like the sea and is actually quite abstract for such a formal area. Statuary offsetting the specimens or is it the other way around? 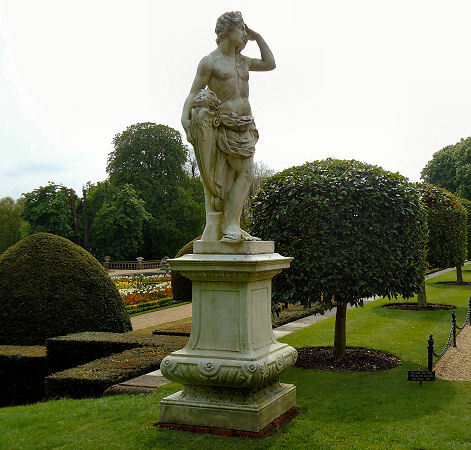 In case I gave the impression there are no other formal gardens there is a water garden to be found as well as the Rose Garden designed by Ferdinand’s Sister Alice de Rothschild which is near the aviary.